The lightweight aluminum frame makes the B-Agile Double easy to maneuver and carry. The height adjustable handlebar creates the perfect fit for parents of all heights. The large underseat basket with access from the front is roomy enough for all your baby gear and belongings. All-wheel suspension for smooth strolls so your kiddos can ride and sleep in peace. The quick-fold design allows you to store the stroller in no time and get on with your day. Cons: my 3 year old is about 36 pounds and 41 inches tall (yes, talk for her age, but the height limit is 44 inches) and she just barely fits in it height wise. Her head has to be cocked to the side to lay back in it. She doesn�€™t mind it, but I wish I felt I could at least get 3 more inches of her growing out it. Her head already touches the canopy when sitting upright. Also wish it came with a snack bar included. A bit to heavy when putting into or taking out of the car. Feels much lighter when pushing. It`s easy to drive, even with one hand. I bought this stroller after searching for a long time for double stroller, my other choices were Goovy sit and stand and baby jogger, that's because I was looking for small size to fit in the car and also light weight. This stroller does not support a infant car seat but the seat reclines to about 150 degrees which allows the baby to relax, I could use head or body support for baby. It fits through door way and easy to push. I was back and forth in getting this stroller but my city select was so so heavy and we couldn�€™t turn well with both kids in it. 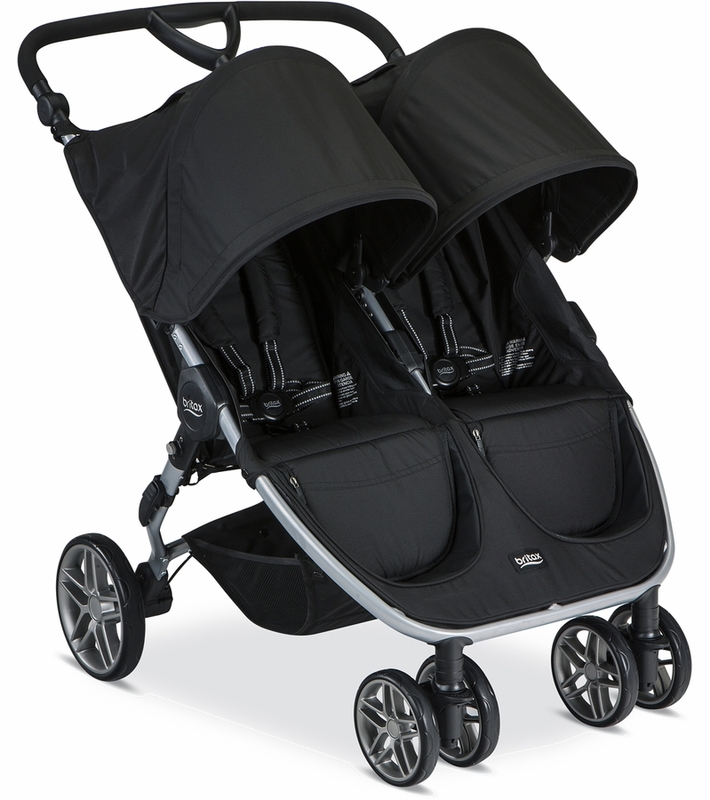 This is the best double stroller I�€™ve owned to date and the price point is great. I have a 4 year old and 6 month old. very happy with my purchase. For the sale price of 249$ this is a great buy and works perfectly for my almost 3yr old and 2 month old. I love this double stroller! It is easy to open/close, maneuver and it fits through doorways. I also like that you can access the storage basket from the front of the stroller by unzipping the compartment just below the seats. Great sunshade. ConsStorage basket below is small, but nothing purchasing an additional storage organizer can?t fix. Received as a gift but will be returning since it doesn't allow you to use it with an infant carrier. Whoever designed the new 2017 model obviously did zero market research here. I have multiple Britax products, but sadly I will not longer patronize Britax and will instead purchase a competitive double stroller and new car seats. If you are a parent who is even thinking of having more than one child, I would recommend you now stay away from Britax strollers and infant seats since you'll be stuck buying a whole new set of infant seats, seat bases, and double stroller from some other company once you have a second. I just purchased this stroller thinking that they had adapters to install a infant car seat. I watched several Youtube reviews that shows it was possible to attach one. Not knowing that they changed the 2017 version. I purchased the stroller and a car seat along with an extra base. 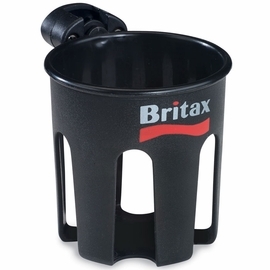 The description on the Britax site is misleading. It says from age 0-5. Seeing that you would think it should be able to accept and car seat. Got the 2017 model. They have definitely taken away a few really nice features that the previous models had and now I can't even use my car seat with it. I very disappointed to learn that the new double stroller cannot be used with a car seat. I want to buy a side by side double stroller that can used from the birth of my second child, when it is really needed, not 6 to 9 months later. I put this stroller on my baby registry at the beginning of 2016 since I was pregnant with my second baby due in April and have a 2 year old so I needed a double stroller and did receive it as a gift. I spent months researching different brands of double strollers and ultimately chose this stroller mainly because my husband and I already have a Britax B-Agile travel system and loved it. We debated between this one and the B-ready which was a very difficult choice, because both have great features. It would have been helpful if any local stores had these strollers in stock for us to see and try out, but none did so we had to make a choice based on what we read and saw on the internet. What ultimately was the deciding factor was price and the fact that both kids have the same view. One isn't underneath the other like the B-ready. I won't lie, I was leaning towards the B-ready, but my husband really cringed at the price of the B-ready. I do love our B-agile double. It has a very smooth ride just like the single version. It has great maneuverability and turns very easily even one handed. It is a very stylish stroller and it can fit through almost any tight space. I have, however, encountered a few places I could not fit and unfortunately it is a bit of an issue as these are places I go to on occasion. My husband and I love the adjustable handlebars. We are both tall, he stands at 6'2" and I stand at 5'9". I am noticing that my daughter who will be 3 years old very soon is almost too long for the stroller. But I am not too worried about it. We love the peek a boo windows, both for ventilation and for checking if the kids fell asleep. My daughter does love to look at me through it too and plays a little game with me. I have gotten many compliments on the stroller when I am out and about. One person who was expecting her second child actually stopped me and asked me about the stroller and I was happy to praise it and give my recommendation to her to get it. The weight of the stroller is great. My husband and I both wanted a stroller that was lightweight so it would be easy for me to pick up and stow. My biggest complaint, which I also have with the single version, is that the storage basket is too small which was why I was leaning towards the B-Ready since it has a very large basket and still weighs the same as the side by side. I cannot fit my diaper bag under there and I find that a big inconvenience. I do like though, that you can access small items that fit in the storage basket from all sides. I also wish I could have the seat face me so my newest baby can see me. He does not really like that he cannot see me sometimes. And although it does fold easily, flat and is lightweight (which I love), it is a bit awkward to pick up and handle. All in all though I do love the stroller. It is lightweight, has a smooth ride, is stylish, easy to fold and stow and highly recommend it. This was the only double stroller that will work for a long time. My husband insisted me on get it but I was scare for the Price... now I love it!! This stroller is perfect!!! it fits in between the doors, it's not heavy, it's very lightweight and you can pack it in your truck. I think this stroller has been great for my twins. I love the adjustable height handle. My only complaint is that I started using this around 7 months and bought the trayss to add for a cup carrier and there doesn't seem to be a way to make my kids sit far enough forward/upright to reach the tray. I think it will take until they are two years old to be able to reach anything on the trays. My daughter owns this and its fabulous -- easy to handle and to put away. 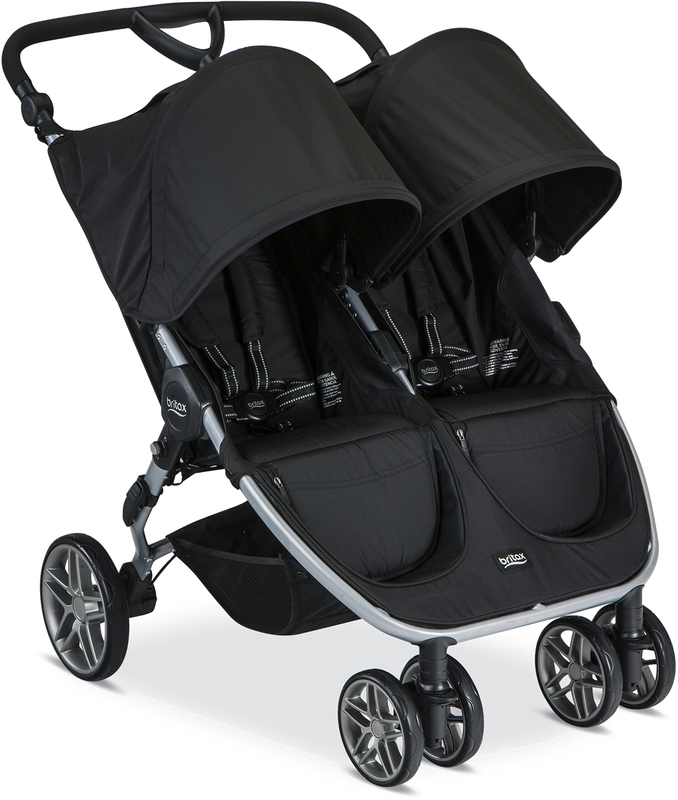 Can't believe I finally found my dream stroller in black! Entire purchase process was great - free shipping, item exactly as promised. Could not find the stroller in black anywhere else! I bought this stroller 5 months ago. It has been perfect for my 9 month old and 4 and 1/2 year old. Very smooth ride nice, good bottom storage, and nice shade features. Folds up and down nicely and slides into the truck of my car perfectly while not taking up my whole truck. Fits through every for as well. If you are looking for a double stroller. I highly recommend this one. This stroller is a smooth ride and a lightweight stroller that makes being a mom of two easy. The stroller is just skinny enough to fit through the door and just wide enough to give each child their own space. The adjustable handle bar makes strolling comfortable for both mommy and daddy (we can move it easily to the height we want). WAIT THAT IS NOT ALL... the stroller comes with BUILT IN CUP HOLDERS!! Every stroller these days makes you buy them separately, but this one comes included. We really like this stroller for how compact it is for a double stroller and for the durability as well. This stroller is great - it was very well thought out in all aspects (design, appearance , maneuverability, etc.) . My tall 3 year old and tall 6 month old fit great . Love the sunshade, one tap brake, easy fold, easy open, storage.... I could go on & on. Awesome stroller, worth the Buy! I recommended this stroller for all families with more than one baby/toddler. We always get asked about this stroller when we are out and about. I can't say enough good things! It is lightweight and duarable. Great stroller. I recently bought this stroller to go out more comfortable with my 2 kids and I love it! It rides smooth comfortable, especially in this hot weather I like that the kids have a way to have air come from everywhere. I bought this stroller over 9 months ago and I couldn't be happier with it. 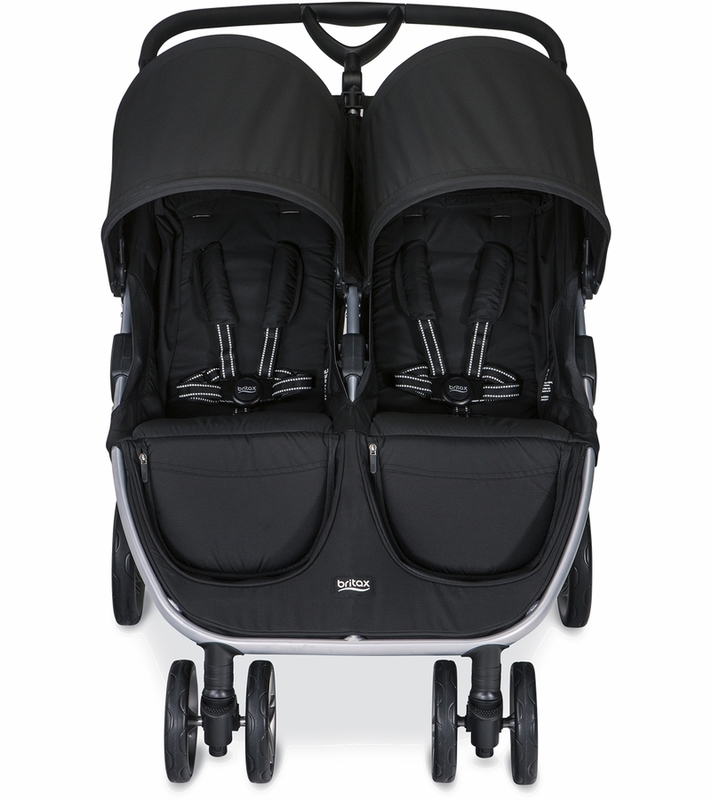 After days of research and already experiencing a tandem stroller I decided on the B-Agile Double. I love so many things about it, how easy it is to maneuver, the large canopies, the storage basket and pockets, and I actually think this double is easier to fold than my first single stroller I had (not a Britax). My biggest fear was that a side by side would be to wide but I never really had an issue with fitting through doorways. Last, bonus points because it is so easy to clean. My kids have done their damage and I just got a damp cloth and was able to remove stains. Bought this for my two kids to have a place to sit. They both fit comfortably with enough room. Folds up compact and very easy. I love how easy it is to push even with my 45# and 25# kids. My only complaint is the basket is not very sturdy, when full, it hangs an inch from the ground. More sturdy slats in the basket would be great to avoid it hitting the ground and getting torn up. 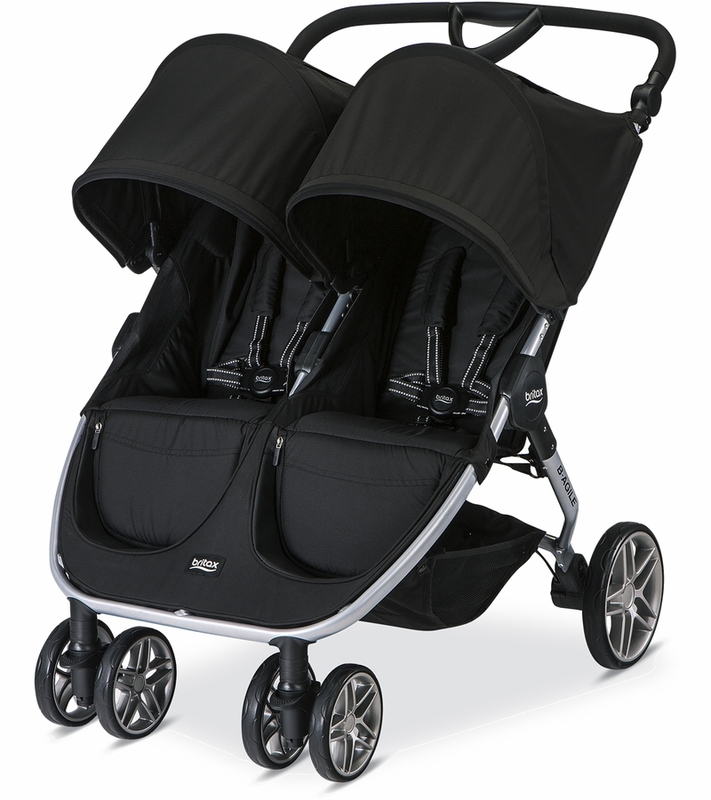 Easy to maneuver double stroller! I have tried several double strollers, and found this one to be light weight, easy to maneuver, easy to fold, and fits through every doorway with no problems. The zippered bags behind the child seat were more useful than I initially thought they would be. The stroller folds up nicely and doesn't take up much room in my SUV or Sedan. Love the fact that the handle bar adjust to different heights. The only complaint that I have was that the sunshade does not completely cover when using the infant car-seat. But that is literally the only complaint. I have also owned the B-Agile single stroller, and B-Safe car seat, and G4 Convertible Carseat this brand is my absolute favorite! recomenme, excelent and comfortable.Im so happy. Im recomended for toddler. We bought this stroller about a year ago and we love it! It's so easy to push and lightweight. My 3.5 year old and 1.5 year old really like this stroller! We started using it when my 1.5 year old was about 7 months. And the inot thing I wish was that we would of had it sooner to use with her infant carrier. We love this stroller! I decided to take the plunge and buy the big guy because I have two babies under two and my arms needed a break! I did a lot of research on doubles and I just didn't want one kid to be stuck behind the other looking at the backside of the seat. Hence the side by side! This thing folds up great, isn't too heavy, is a life-saver for our family when we travel which is a ton, and the best part is that it really does fit through all doorways. It's not going to be the exact same as a single so expect to do some maneuvering while walking around crowded areas or whatever. Still great storage space underneath and I click my mommy handle on and my drink/key/phone holder on the straps and I'm good to go. I decided to take the plunge and buy the big guy because I have two babies under two and my arms needed a break! I did a lot of research on doubles and I just didnt want one kid to be stuck behind the other looking at the backside of the seat. Hence the side by side! This thing folds up great, isn't too heavy, is a life-saver for our family when we travel which is a ton, and the best part is that it really does fit through all doorways. It's not going to be the exact same as a single so expect to do some maneuvering while walking around crowded areas or whatever. Still great storage space underneath and I click my mommy handle on and my drink/key/phone holder on the straps and I'm good to go. As a mom of now two I am so happy that I chose this stroller. After hours of research on double strollers this one by far out ranks any other one that I have tried. With the large cargo basket, the extra large canopies, and the adjustable handlebar, I could not ask for anything else. My son loves how the seats recline all the way so he can sleep and the carseat for his sister clicks right in. Also the storage bags on the back behind each seat make a great place to store juice, snacks, diapers, and anything else I need to get to in a hurry. Could not rave more about how much I love this stroller. Pros: 1. Can go through every single door! 2. Light 3. Easy to fold ,open, and store. 4 . Plenty of room in the bottom. 5. Nice zippered pockets in the back of each seat. 6. Very nice sized canopy for shade and protection. 7. Sturdy and safe, won't tip over, good break. 8. Beautiful 9. Kids love it and we, the parents love to push the stroller, the stroller glides! Cons: 1. Difficult zipper for the front of the bottom. 2. Somewhat hard to recline, we still have to figure this out. Otherwise, we love this stroller and reccommend it to others all the time! I had the B-Agile Travel System (single) for 2 years before purchasing the double when my second child was born. I LOVE it! It is so comfortable for the kids, easy to open and close and plenty of room under the seats for storage. I love how long the sun covers are... they keep the kids protected from the elements. I would recommend it for any mom or dad! recomenme, excelent and comfortable.I'm so happy. I'm recomended for toddler. I bought this for my 2 year old and new born and it's amazing easy to get around and they both have space. Great For Twins!!!!! I feel compelled to write this. Great! Comfortable ride for my little ones. Bought for two babies and is so easy to put together and clean up! Has everything I need & more! I love the option to recline seats individually as well as the Canopies. It does fit in doorways! It's so smooth & easy to maneuver. It's beautify made. Easily folds down. It's the perfect double stroller for me! "Its The Cadillac of Strollers"
Disappointed is the best way to describe this stroller. We had the Britax B-Agile Travel System for my daughter and it was great. Lightweight, easy to open and move, and convenient with the baby carrier easily fitting on the stroller and allowing you to cover your baby from the elements. Everything that made the single stroller great, the double stroller does not have. The stroller is quite heavy and not easy to maneuver in and out of your vehicle. It is difficult to navigate through some doorways. It will fit through them, but you often have to hit an awkward angle to make it through. Finally, the most disappointing feature is that the baby carrier options. The carrier fits, but it is impossible to cover the carrier with the hood and it is also quite difficult to get the hood over our toddler in the other seat. On top of all of this, we have to re-buy the accessories for the new stroller. The old tray doesn't fit. Overall, it seems like Britax was lazy this time around in hopes of cashing in on people who had the single stroller. A word to those shopping, there are other double strollers that your Britax car seat will fit in! Shop around! We will definitely be looking at a different brand for future car seat/stroller decisions with our next child. I just received this stroller!!! It was very easy to assemble and love how it is so easy to push!!! Bought this to use for long walks with my 2 1/2 year old and 2 month old. Both fit very well in the seats. I can't wait to use all the features of this stroller! Truly had everything I wanted! One of my favorite features is the fact that there is wonderful ventilation through the optional open netting while my 2 month is reclined and napping. So many things to love about this stroller! Definitely worth the money! Serious shout out to Britax!!! I've logged 25miles this week on my B Agile double stroller. This isn't a city walk either...its opening and closing the stroller with one hand, getting 2 babies to sleep, jogging on grass, rocky hills, and country roads. Every mile was a joy and it wouldn't have been with any other stroller!!! I am so excited to take my kids for walks now that she purchased this stroller. It is so easy to use. I can operate this stroller with one hand. The serial number though needs to be clear marked for registration. The product took 10-15 minutes to set up which with the twins helping! I bought this to use with my 2 year old and newborn. My 2 year old fits in the seat nicely. The stroller also steers easily and is reasonably priced compared to other strollers. We bought this product about 4 ago it never stored outside a t is already fading it gets stained very easily and the tires are already wearing out on it.the kids are not comfortable in this seat because it doesn't sit all the way up. Very disappointed since this is a well trusted brand. I wouldn't recommend stroller on the upside it does drive nice. Will a car seat fit on one side while my 2 1/2 year old sits on the other side? If so, what is the best car seat that fits? As per the provided description: This stroller DOES NOT ACCEPT ANY CAR SEATS. Can u use a britax carseat with this stroller? As per the information provided, this stroller CANNOT BE USED WITH ANY CARSEATS. Please note that this model CANNOT accept a car seat or be used as a travel system. 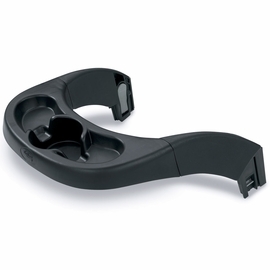 Is there an infant car seat adapter for this model?